John Cameron says feeding Alkalage helps deliver increased dry matter intakes. Making your own alkalising rations can be an eﬃcient and beneficial feed option for farmers able to grow their own cereals, and it is a route John Cameron – farm manager at the University of Liverpool’s Wood Park Farm – is thankful he took 10 years ago. The farm is mainly used for teaching the university’s vet students about modern dairy farming, and on it John runs a closed herd of 200 pedigree Holsteins plus followers. Included in the set-up are 81 hectares (200 acres) of owned land, while crops are contract grown on a further 53ha (130 acres). Currently, cows are milked three-times-a-day and each yields an average 11,500 litres annually – a significant increase from production in 2006 when the team first tried making their own Alkalage. 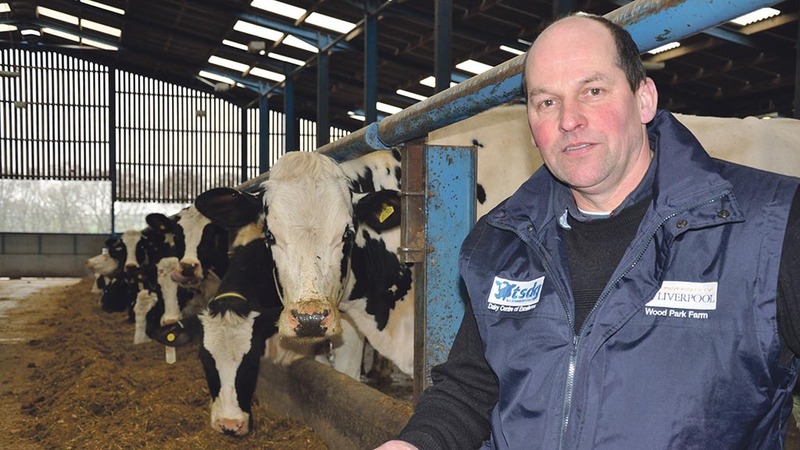 John explains: “We were persuaded to make our first lot of Alkalage after one of our vets attended a meeting extolling its virtues – the fact it has a high pH, with plenty of fibre and good nutritional value – and it works as a counter balance to traditional acidic silages. Since then the farm has invested in new sheds and a new parlour, upped the cow numbers and switched to milking three times a day, which have all contributed to the increase in herd performance. However, John says the dietary changes made were also hugely significant. At the moment, the cows are averaging 26kg dry matter intake and 38 litres of milk at 3.9% butterfat and 3.15% protein. The milkers are fed TMR, all in one group, and the ration includes 0.15kg minerals per cow, 11kg of blend, 3kg of Alkagrain, 1kg of haylage, 5.5kg of Alkalage, 8kg of maize silage, 20kg of grass silage, 2kg of water and 1kg of molasses. For John, another main benefit is there is no specialist equipment needed and crops can be grown asnormal. “I think the perception by many is Alkalage is expensive and diﬃcult to make properly, but we’ve not found that at all. “We grow a normal crop of cereals to the best of our ability and harvest them when they are ready to harvest, then it is down to the contractor to do the rest. It is preserved in a clamp with the Home n’ Dry pellets, and as long as it’s kept dry, it stores really well. It is a fairly straightforward process, especially if you have a good contractor who knows what they are doing. “It is not costing us any more to make the Alkalage, compared to our previous system, and the benefits it brings with the increased cow intakes, are huge. We’ve been making it for 10 years now, which is testament to the success we have had with it,” adds John. FiveF says Alkalage production is a proven method of utilising own-grown mature cereal crop feeds to greatly increase animal performance and health potential while reducing the proportion of purchased feeds in the diet.